Details about how your account should be setup so multiple parents all get team communications. If you believe you have setup your account incorrectly and need assistance. Please collect your primary account email address as well as all secodary parent/guardian email addresses and provide them in email to: web@skilestest.com. 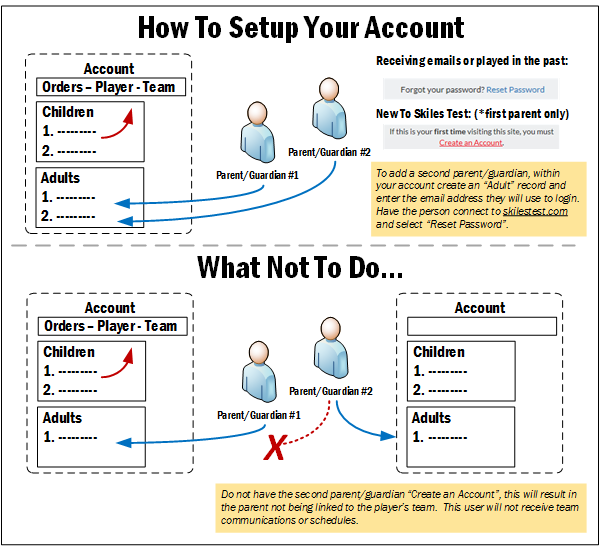 If you want to setup an account, but your players are already registered; follow these directions. Contact the primary account holder that registered your players. The primary account holder must define an additonal Adult on their existing account (see above). A child player can only be registered from a single account. If adults want to maintain separate accounts but still be tied to a player's team for access to resources and communication, adults in the unassociated account may register as a "Linked Parent". A Linked Parent is not automatically associated with an player or team. After an adult is registered as a Linked Parent, you must contact enrollment@skilestest.com to be connected to the team of each player. At the end of each field there is a Share with My Team checkbox, if this item is unchecked coaches cannot see this information. ​Check the box for Share with My Team. You should select an emergency contact other than the adults listed on your account. As long as your contact information is shared with your team (see updating your contact information above), your coach will be able to contact parents in case of an emergency first. If the parents are unavailalble, do not respond, or are injured, the coach can contact the person identified as the emergency contact as a resource.